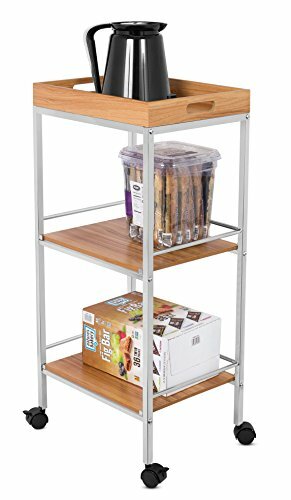 BirdRock Home 3-Tier Rolling Serving Cart is the perfect kitchen storage solution that helps organize kitchen accessories, utensils and serving items. The serving cart is equipped with 3 shelves crafted from a durable steel frame and beautiful MDF woodgrain shelves. The serving cart's top shelf may be removed and doubles as a stand-alone serving tray. The cart is equipped with 4 caster wheels with 2 locking wheels allowing the cart to stay stationary when needed.